Such was the success of last year’s ‘A Simply Delicious Christmas’ that Rory and Darina are back - and this year, with two Christmas programmes. Once again, they bring thirty years of teaching experience to bear, and a style and substance that are unique to Ballymaloe, plus of course some sibling rivalry. For many people, entertaining at Christmas is about much more than the day itself, so they have come up with suggestions that are perfect for the festive season, and straightforward to achieve. (Sponsored by Kerrygold). In programme one, Darina and Rory prepare Grapefruit, Pomegranate and Mint Cocktail, and also a Kale, Fennel,Radish and Parmesan Salad. Other dishes include Turkey Liver Pate with Sourdough Toasts, Onion Marmalade, and a delicious Chocolate Yule Log. Programme two recipes include Prawns Mayonnaise and Prawn Bisque, and also Roast Duck with Orange served with Brussels Sprouts with Toasted Hazelnuts and Candied Bacon. Darina and Rory also prepare a Traditional Sherry Trifle. 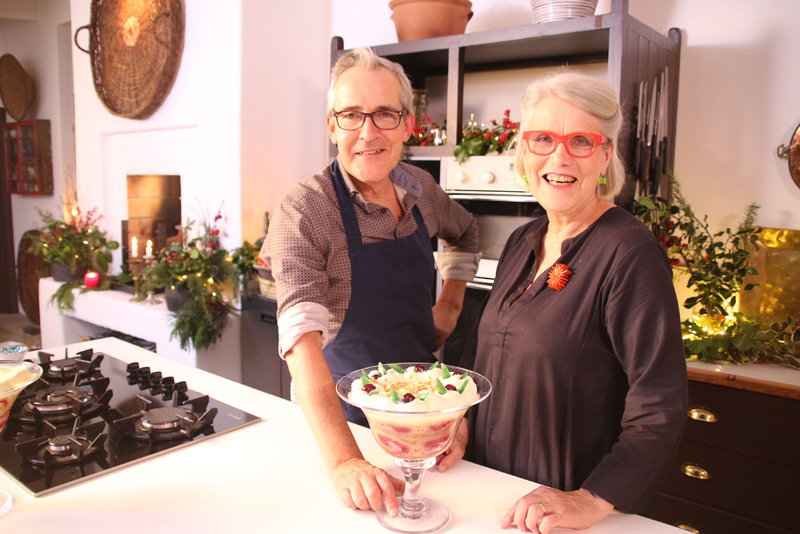 'A Simply Delicious Christmas with Darina Allen and Rory O'Connell' is produced by David Hare of InproductionTV for RTÉ and is sponsored by Kerrygold.